Just near the Twelve Apostles on the Great Ocean Road in Victoria, Australia, the Gibson Steps is a fantastic location to descend from the clifftops to the wild beach. Access to the sands is via a dramatic cliff-hanging walkway, but this wild beach is definitely not a place to swim. However it is a very popular place for picnics and watching sunsets. There's nothing like watching the sun setting behind the 12 Apostles. This image belongs to the travel and nature stock photo library. This stock photo of Sunrise at The Gibson Steps is available for licensing for commercial and editorial uses including websites, blogs, books, magazines, brochures and advertising. Restrictions may apply for images which contain third party copyrighted material or sensitive subjects. Photos of artwork are for editorial use only. 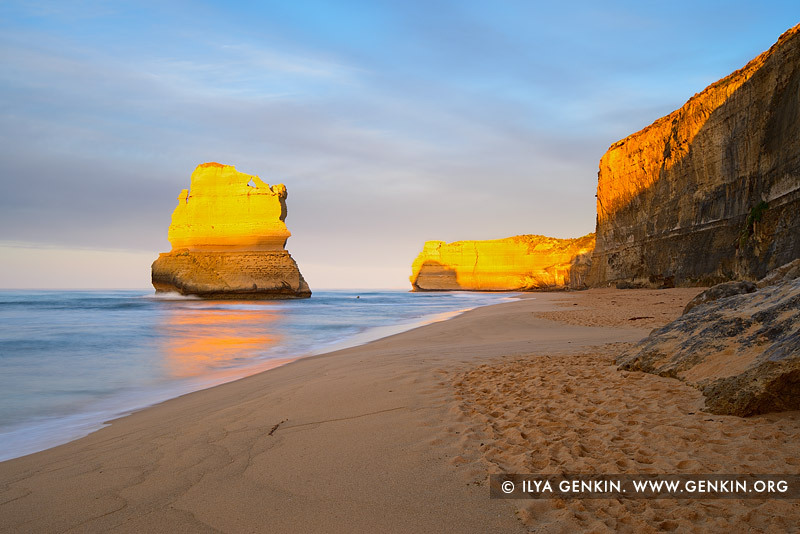 This image id APOST-0023 of Sunrise at The Gibson Steps, is copyrighted © by Ilya Genkin. This is not a public domain image.